The main ingredient in stainless steel plate is iron. The material also consists of various other elements which act as so-called alloying agents. 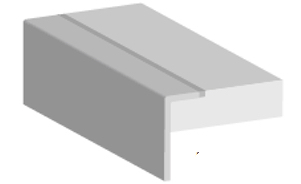 Their main function is to give the steel plate the desired properties, such as strength and hardness. Five of the elements in the steel we use help ensure that the steel does not rust in the same way as non-alloy iron. The most important of these elements is chrome. Although a worktop made of stainless steel is cold and hard, it is pure and unadulterated nature. *Minor repairs such as edge damage can be carried out by a trained professional. DFI-Geisler steel worktops are made of 1.5 mm stainless steel. The steel is bonded to strong chipboard, with a total thickness of between 12 mm and 80 mm (although no more than 60 mm if the worktop has a front edge in wood). 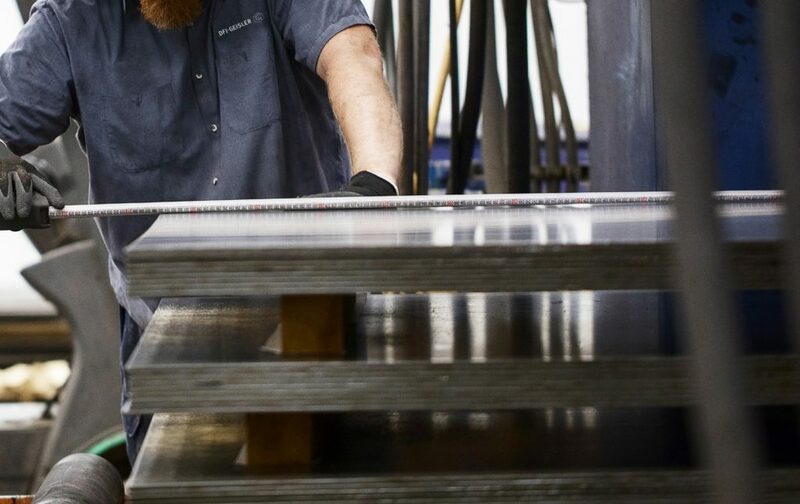 We can manufacture your worktop from flat steel or in other thicknesses of stainless steel at extra charge. It is no coincidence that celebrity chefs and most professional kitchens use stainless steel work surfaces. 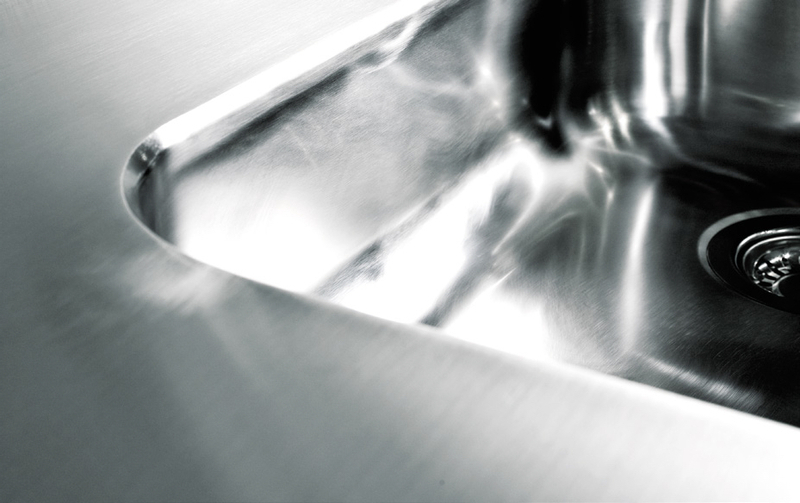 Steel is incredibly hygienic and extremely easy to keep clean – even when it gets hectic in the kitchen. To clean the surface, use a soft cloth wrung out in warm water, and always finish by wiping the surface with a dry cloth. This will prevent unwanted limescale deposits. The best way to give steel worktops a thorough clean is to use soap flakes. In addition to removing stubborn stains, it will saturate the surface and make it more resistant to dirt. Steel work surfaces and hot saucepans are not a good mix. Although it may be difficult to believe, stainless steel discolours if you leave hot objects on the surface. Steel also expands when heated and this may cause the steel to detach from the underlying chipboard. In short: Always use a trivet or table mats. Steel is the undisputed favourite of many kitchen architects. And with good reason. Due to its neutral surface, stainless steel can be combined with any other type of material – whether you want to give the steel the lead role or allow it to play second fiddle in your kitchen design. As an elegant addition to the worktop, an edge profile in solid wood can be fitted on the front edge, blending hot with cold and achieving harmony of design. If you choose a steel worktop, you need to decide whether it should be ‘brushed’ or ‘curled’. 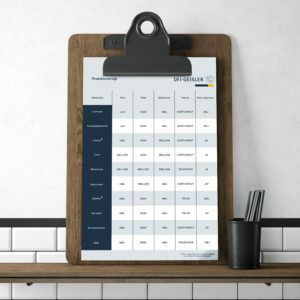 The properties (and prices) are the same, so it is merely a question of taste – a uniform polish with a stylish look, or the more raw appearance of the uneven, ‘curled’ polish. 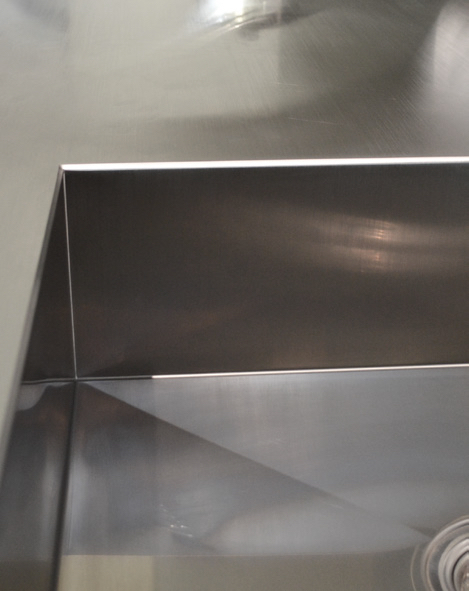 DFI-Geisler steel worktops are always delivered with a steel sink welded into the surface. The weld is subsequently polished flat so that the steel worktop and the sink give the appearance of a single, clean and hygienic unit.